Kansas City, 1933. Frank Nash is a petty criminal being escorted back into town by train. FBI agent Vetterli, waiting for the convoy at Union Station, is expecting a routine assignment. What happens at Union Station that day is a massacre, with no one knowing who really pulled th... read full description below. Kansas City, 1933. Frank Nash is a petty criminal being escorted back into town by train. FBI agent Vetterli, waiting for the convoy at Union Station, is expecting a routine assignment. 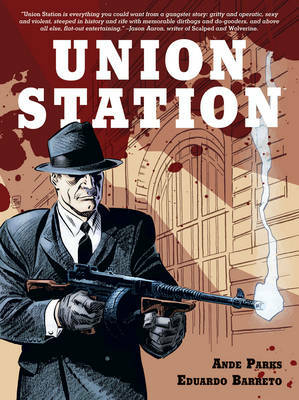 What happens at Union Station that day is a massacre, with no one knowing who really pulled the trigger first. Newspaper reporter, Charles Thompson, is a witness to the events at Union Station and begins a personal investigation that may cost him his life, and that of his family. In the tradition of Torso and Road to Perdition , Union Station is the true story that started J. Edgar Hoover's 'war on crime' and helped shape the FBI into the agency it is today.